The Novum Medical Power Pole is truly one of a kind. This unique I.V. pole protects medical staff from the inevitable strain that comes as a result of heavy lifting. I.V. bags that are necessary in the operating room, cytology, or arthroscopy are typically much heavier and it require extra exertion to put them into place. 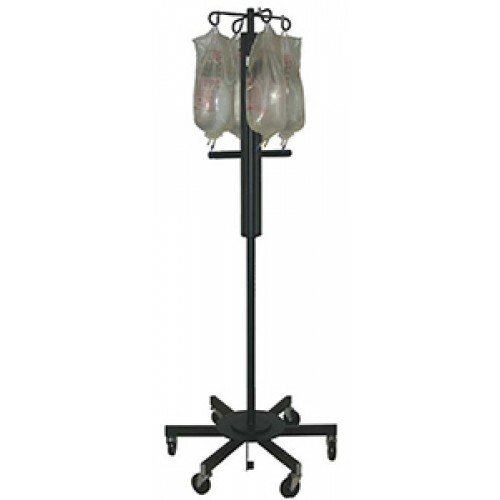 The Novum Medical pole has an internal gas cylinder that provides up to 20 pounds of lift assistance, allowing nurses to preserve their energy for better uses. This powered I.V. pole does not require any cords, batteries, electricity, or hydraulics to function and is the same size as a conventional I.V. pole. The Novum is designed to hold heavy 3,000 ml I.V. bags. These bags can easily weigh up to 40 pounds when they are all placed on the pole. The pedal activated lift assist helps support up to 20 pounds of the weight, reducing the weight the medical staff have to lift by half. This power I.V. pole is height adjustable with a range of 65-89 inches. It has a sturdy steel construction and a black powder coat finish. At the top of the pole are four heavy duty ram's horn hooks. The each of the six legs has a heavy duty swivel caster that makes the pole easy to transport. The pole is latex-free and has been tested and approved by the OSHA.